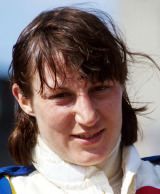 The daughter of a South African motorbike champion, Desire Wilson drove once in the Formula One World Championship, failing to qualify at the 1980 British Grand Prix. On what she recalled was "most disappointing weekend of my life" she was given a dreadful car to drive, describing the whole event as a "a con". A year later she drove a Tyrell in the South African Grand Prix climbing through the field from last off the grid to ninth before she spun off. Although this was deemed a championship race at the time, a few weeks later it was downgraded because of the political situation in the country. Nevertheless, she holds a place in the record books as the first (and, to date, only) woman to win an F1 race of any kind when she was victorious at Brands Hatch in the short-lived British Aurora F1 series in 1980. That year she also won World Endurance Races with Alain De Cadenet at Monza and Silverstone. She entered the 1982 Indianapolis 500 but once again failed to qualify.